Many people struggle with sensitive teeth every day. According to the Academy of General Dentistry, more than 40 million adults in the United States suffer at some time from sensitive teeth. What they might not know is why their teeth are sensitive and that there may be an easy solution to getting rid of the tooth sensitivity. Don’t be alarmed if you have a sensitive tooth, it is very common for tooth sensitivity to come and go without any consequences, however, you should see your dentist for an exam to be sure there is not a more serious issue causing the sensitivity. At Sarasota Dentistry, we take sensitive teeth very seriously and we have a variety of treatment options which have proven to be successful in relieving tooth pain, gum pain and sensitive teeth. See below for a list of causes and cures of teeth sensitivity – even a few at-home remedies that could give you immediate relief. Don’t let teeth sensitivity ruin your life. Tooth decay may be treated with a crown, filling or sedative filling. Fluoride application – a common first line of defense against sensitive teeth. A varnish is placed on the exposed root surface and remains on the tooth for about 2 hours minimum. Root canal therapy may be indicated for irreversible nerve damage to the tooth causing extreme cold sensitivity. 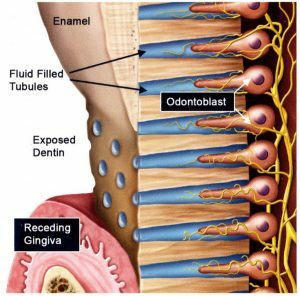 Root surfaces may require bonding, crowns or veneers to seal the surface and protect the root. Avoid excessively cold or hot food or drink! Try using sensitive tooth paste, such as Sensodyne or Instant Pain Relief by DenTek. Avoid using whitening products. Including whitening mouth wash, tooth paste, gel or white strips. Apply fluoride gel or tooth paste topically and use fluoride mouth rinse such as ACT. If you have a whitening tray, you can use it to better place fluoride gel or paste on the tooth. Switch to a soft bristle tooth brush or an electric tooth brush. Dr. Michael and his highly trained dental team have been providing relief for teeth sensitivity since 2001. There is no reason to suffer when there are a number of remedies that will alleviate tooth sensitivity. Call (941) 929-7645 or e-mail us today to schedule a consult with Dr. Hank Michael at Sarasota Dentistry.